Bus from Segamat to Johor Bharu is the most popular bus service to connect people between the two cities especially for resident in Segamat who studying and working in Johor Bahru or Singapore. Passengers prefer to take bus over train because of the frequent daily schedule of bus service and shorter duration of journey. S&S International, KKKL Express and Cepat Express are the only three bus operators operating bus service from Segamat to Johor Bahru. These bus operators are famous among local because of their punctuality and frequent schedule. Cepat Express is especially well-known in Segamat because their headquarter is based in Segamat. The travel duration for bus from Segamat to Johor Bahru is about 3-3.5 hours, depending on the traffic and weather conditions. Washroom break will be given upon request from the driver during the journey. The bus fare for bus from Segamat to Johor Bahru is reasonably charged at RM 18.20. 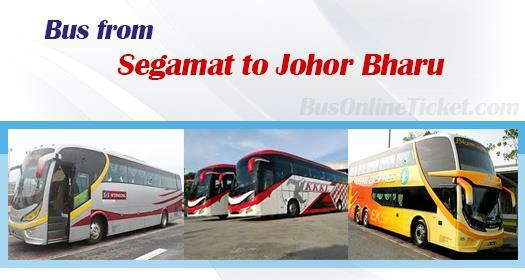 The bus fare is budget considering all buses plying between Segamat and Johor Bharu are VIP bus with more spacious seat. The departure point in Segamat is located at Segamat Bus Terminal and the arrival point in Johor Bahru is located at Larkin Bus Terminal. Larkin Bus Terminal is the main and largest bus terminal in Johor Bahru. Please note that there is cross-border bus service available in Larkin Bus Terminal for passenger to travel from Larkin Bus Terminal to Singapore. Booking with the most convenient, reliable, and secure online booking portal BusOnlineTicket.com, you can have a peace of mind that your bus ticket is reserved before your trip. Hurry up and book your bus ticket from BusOnlineTicket.com before they sold out especially during peak season.